There are 4,307 items available. Please enter a number less than or equal to 4,307. Arrived promptly and in good condition. Suits my needs at the moment..
Fast shipping! Item as described!Great E Bay experience! Thanx!!! A+! Item as described, very quick delivery, great seller!!!! Item as described Super Fast Shipping Thank You So Much. As described but poorly packaged. I Can Hear My Vinyl Again! Like many others, I have a receiver and I picked up a turntable at the thrift store, but I couldn't get noise out of it and thought it didn't work. I didn't know until recently that the receivers from my youth had phono preamps built into them. Fast forward to now and the Pyle preamp solved the problem! It is really small, hiding easily behind my receiver. It doesn't have a power switch, but if your receiver has plugs in the back that power on and off with the unit, then there's no worries. Otherwise a person could pull the power plug if they're concerned. To be honest, the preamp isn't as loud as I hoped, but it is so much better than no sound at all. I have to turn the volume knob up a bit compared to the radio, but the sound quality is very good. I recommend! My Technics SL-220 has been sitting for years because my Yamaha Amplified didn't have a turntable input. The PP999 did the trick perfectly. The SL-220 now plugs into the Amp's VCR input and sounds great. There doesn't seem to be any signal loss. I'm not an audiophile, but I know what sounds good. My record collection has been resurrected along with my turntable and I couldn't be happier. Many amplifiers do not have specific input input for a turntable and when I moved my turntable to a new location and different amplifier I found that I could not get sufficient volume. I am an audiophile, and have been since the '60s, so I knew what the problem was immediately. 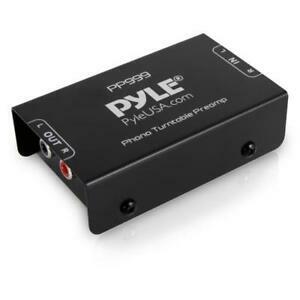 The Pyle Pro PP999 phono turntable pre-amplifier solved the problem. It is very easy to install. The inputs and outputs are clearly marked so you just have to connect your left and right channels from the turntable to the input jacks, connect the output jacks to your amplifier, plug in the power converter, and you are done. You should also use the ground connection if at all possible to eliminate the possibility of hum caused by interference from the electrical circuits. It has been great to listen to my vinyl collection again after it has been sitting idle for a very long time. Great Product. Easy to use. Great Value! I wanted to connect my Pioneer PL600 to my computer to take my old record albums and put them on CD. The problem was there was no sound coming from the turntable to the computer. After a little research I found out why. There is no amplification from the turntable and this also causes a problem with newer amplifiers/tuners used in home entertainment setups which only have Aux In, etc, and do not provide amlplification. The problem is solved with a preamp such as the Pyle PP-999. which can be used with a computer or home entertainment setup. It is easy to install, just make the simple connections. I chose Pyle because of previous experience playing in a rock band and using their equipment. If you are having the same problem as I did this is your fix. I recommend this product and would buy it again.